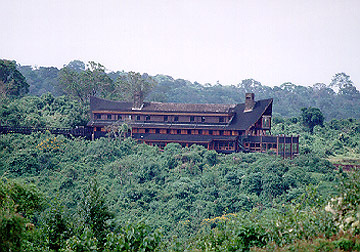 The Ark Forest Lodge located on the western slope of the Aberdares and is built adjacent to a waterhole and salt lick. The area is flood lit at night. There are several areas to watch the animals including a lounge/bar area, outside roof top, outside lounge and a stone room with a waist-high opening at ground level. The actual rooms are small (like a ship) and are equipped with a buzzer to wake one up for the arrival of certain animals. Or turn it off and sleep. After a nice lunch and some time to explore the Aberdare Country Club, part of the group including myself departed for the Ark. On the winding mountain drive through thick forests, we saw herds of African buffalo, elephant, and monkeys. Once there, we were not allowed to leave and were dependent on the animals coming to us. Nothing much happened until evening when buffalo, antelope and then groups of elephant arrived. There was even a mother rhino and her baby. 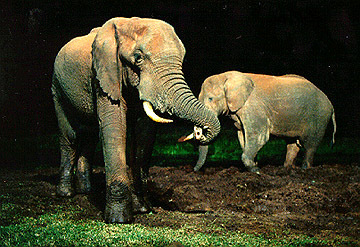 When a bull elephant got too close, she snorted and the elephant raised his trunk and backed off. The raised trunk is a symbol of good luck and also shows non-aggression by the elephant. The mother rhino shuffled her baby off when two buffalo started fighting. The best place to watch is at ground level where one can safely be within 10 feet of the animals and be able to hear all the grunts, snorts etc. The Ark attracted large amounts of insects including moths (see the link to moth photos on the main page) since it was the only light around. By morning, large birds arrived to pick the juicy moths from the side of the building like a giant bird buffet. The lodge actually looks like a giant Noah's ark. 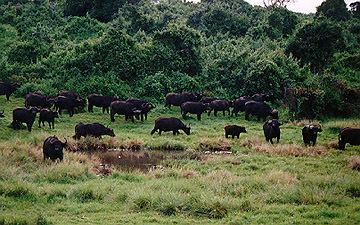 A herd of African buffalo on the road to the Ark. These were part of a larger herd that visited the Ark at night. The elephants seem to have a form of communication/greeting by touching each other with their trunks. 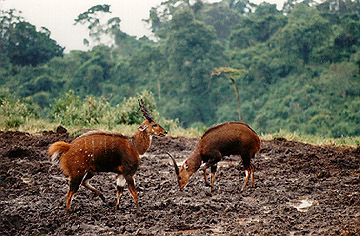 These animals arrived at dawn to forage and drink water. 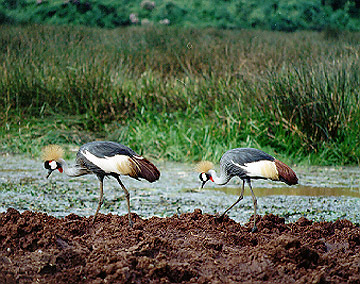 The two gray crowned cranes spent the whole afternoon and the next morning at the waterhole. After leaving the Ark, we stopped at the equator where there are some shops and to watch the locals demonstrate the change in direction of water flowing out of a bottle. This elderly man was carrying some dried goat skins. His English or my Swahili was not good enough for me to determine the purpose of the skins. He did let me take his photo, for a small fee.